Miami is to Latin America what the Netherlands is to Europe. 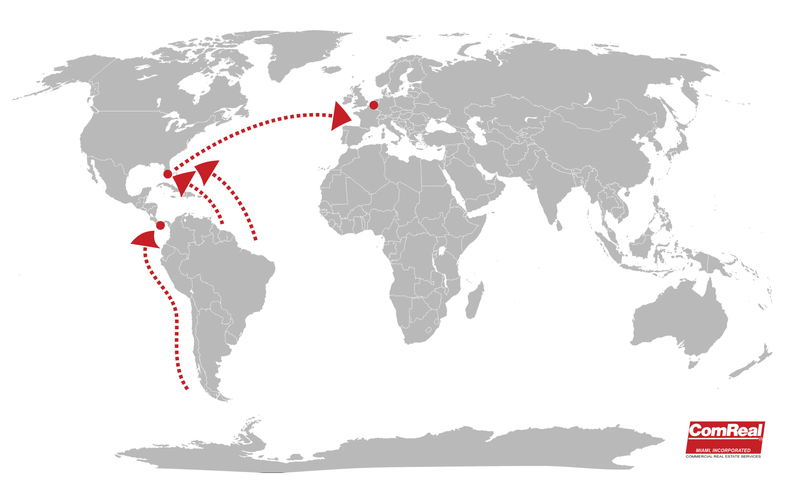 Miami has the relationships and trade routes to Latin America, South & Central America and the Caribbean; just like the Netherlands has with the rest of Europe. Last week, I had the opportunity to tour the Netherlands with a small delegation which included representatives from Port Miami, Florida East Coast Railway (FEC) and Miami logistics providers. The Netherlands is very similar to Miami because they have more service related (than production) industries such as logistics. We both have the international relationships and trade routes. Interestingly, both business communities take advantage of the use of foreign trade zones (FTZ’s). 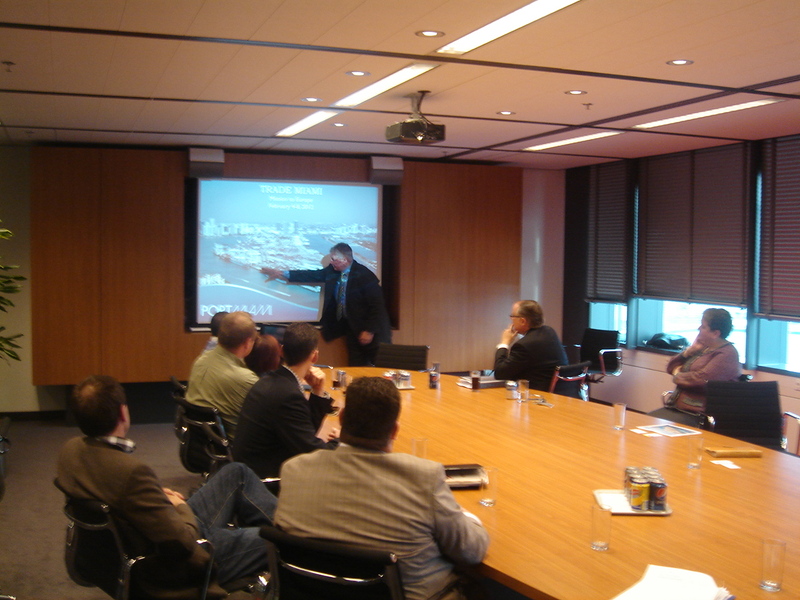 Schiphol is focused on marketing it’s air cargo services to American manufacturers and distributors. The largest flowers auction in the world is also in Amsterdam; in comparison, Miami International Airport receives over 90% of all fresh flowers that enter into the USA. On a side note, the Netherlands also has water issues as they have to constantly battle sea water pouring inland since they are below sea level; this reminds me of our water issues here in South Florida versus the Everglades. Our delegation then visited with the following Ministries of the Netherlands: Infrastructure and Environment, Economic Affairs, and Foreign Affairs. Here we learned how the Dutch operate their economy. Private / public partnerships are encouraged and promote co-operation and harmony. A few of the major industries that the Dutch are best known for include: farming (produce, fish and flowers), energy, chemicals, data ports and logistics (logistiek). They are extremely focused on agri-products (both imports and exports). Did you know this?! 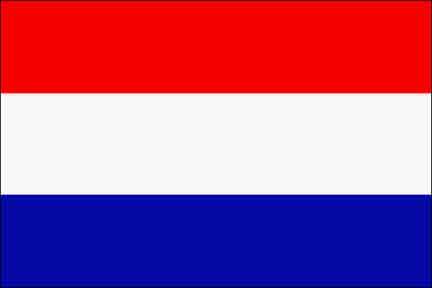 The Netherlands is the 3rd largest investor in the USA, according to the Netherlands Consulate in Miami. The Foreign Trade Agreement (FTA) between the USA and the European Union known as the trans-Atlantic agreement could liberalize trade, reduce tariffs and other penalties which could benefit the people of all countries involved. However, there are many Americans and Europeans that are against free trade which may likely destroy this opportunity. A representative that I chatted with from the US Department of Commerce stated that the free-trading Dutch do have some frustrations with the USA and the rest of the European Union’s anti-liberalism. This is disappointing since both the Netherlands and the USA could have so much to benefit from one another. Some descriptions that I came up with for the Dutch that seem to best describe them are efficient, forward-thinking, productive, trustworthy and friendly. They are also very tall! The Dutch are very impressive overall and seem to desire win-win relationships in trade. On a cool day in the 40’s with some refreshingly windy rain, we visited the Port of Rotterdam. It stretches nearly 30 miles along the Maas River! This enormous size is understandable when you then consider it is the largest port that serves over 500 million people in the European Union. Our purpose here was to promote Miami as the “Perishables Gateway of the Americas”. Specifically we hope to serve as the primary entry point for fruits, vegetables, plants, flowers, seafood and meats from Central and South America destined for Europe via Port Miami as a transshipment hub then on to Port of Rotterdam. At this time already, the Netherlands is Port Miami’s 7th largest importer and 12th largest exporter. Visit the Port of Rotterdam at www.portofrotterdam.com. The Port officials highlighted several important trends. First, there is a growing demand for foods everywhere. Second, there is a global shift in the countries that traditionally produce products versus those that consume them. And finally, there is an increased focus on sustainability, efficiencies and intermodal transport. The Dutch are long term planners. They have a plan that they are in the process of implementing by 2030. To take advantage of the increase in the transportation of perishables, the Port is constructing a new warehouse known as “Cool Port”. 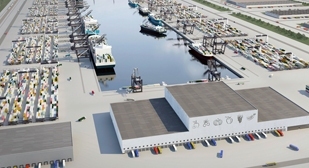 The refrigerated warehouse will be ready in 2015, just in time for the opening of the new Panama Canal which will allow larger ships to travel from Central and South America (countries such as Peru, Argentina and Chile) to the Netherlands via Miami. In reverse, the Netherlands is the world’s 2nd largest exporter of agricultural products. Port Miami has spent over $2B for improvements such as the Miami Tunnel, deep dredge to 50′, the FEC Rail, cranes, bulkheads, and more. In addition, Miami has been improving our roadways and expressways for transportation. New speculative warehouse construction was about 2M sq. ft. in 2012 with an additional 2M to 4M sq. ft. expected within the next couple of years. I think Miami is being viewed globally as a major logistics city. In fact, Miami may become a “Dutch hub” for logistics (or logistiek). Learn more about Port Miami at www.miamidade.gov/PortMiami. Personally, this was a very exciting trip for myself. My 10th great grandfather, Gerret van Sweringen, sailed from Holland in 1656 on the ship, Prince Maurice, to New Amstel, Delaware in America. He served as the ship’s “supercargo”; which was the person responsible for both the cargo and passengers. It was somewhat nostalgic to visit Port Rotterdam and to wonder what he may have been thinking when he left from Holland for America so long ago. I bet he would’ve never believed that nearly four hundred years later, one of his descendants would return to Holland; let alone be in nearly the same profession as himself! Please contact me anytime if you would like to discuss the opportunities between the Netherlands and Miami as well as Miami warehouses for the Dutch from the Netherlands. I would be happy to share with you the presentation on Miami’s warehouse market that I handed out. In addition, please stay tuned to read about part two of our trade mission to the 2013 Fruit Logistica convention in Berlin, Germany. You might also be interested in joining the Miami Dutch Chamber of Commerce at www.dutchbizmiami.com. >>> . Dank Je Wel (thank you very much)!!! Ed – the article captures the “FEEL” of our trip to Amsterdam/Rotterdam. In a nutshell you conveyed the true meaning of all the potential opportunities that MIAMI has across the ocean, in addition to our friends to the South. Very exciting to have been with you on this trip to explore opportunites to the East……..
artwork – mostly from the 1600’s. I think that may tell me more about life, clothes and food when Gerritt was there. I went to the Schiphol airport link you put it and understand that there is a Riksmuseum exhibit there to see. I also checked on some shopping at the airport, which I understand is very big and nice! Your comments about the descriptions that you came up with for the Dutch that seem to best describe them are efficient, forward-thinking, productive, trustworthy and friendly. They are also very tall! The Dutch are very impressive overall and seem to desire win-win relationships in trade. (since I am tall – I like that too) I think it would be interesting to learn more about “trade” between the Netherlands and America in the 1600’s. I’m planning on cool, perhaps rainy (like the Pacific NW) and windy weather in early spring. I guess layering is the best plan. I may be working with a genealogist there as well, so am looking forward to learning more.